All lawn mower blades will require sharpening during the mowing season. According to the Louisiana State University agricultural center, sharp mowing blades produce a more vigorous lawn that has fewer pest and disease problems. Lawns that require a greater mowing frequency may require that the blades are sharpened several times during the growing season. 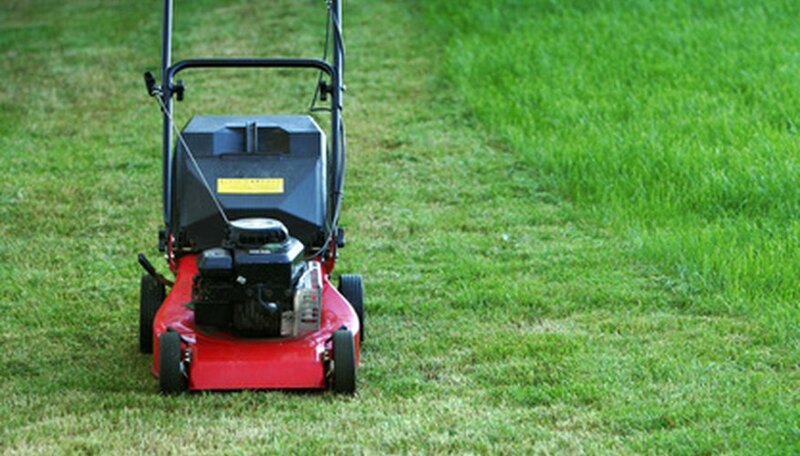 To sharpen mower blades properly, the metal blades must be taken off the mechanical device. Pull the rubber sparkplug wire from the sparkplug on the lawn mower engine. Typically the sparkplug is on the rear of the engine that faces the push handles on a lawn mower. Consult the manufacturer's specifications if you have trouble identifying the sparkplug location. The sparkplug wire must be removed to prevent accidental engine-starting while you work on the lawn mower. Insert the gasoline siphon into the gas tank. Place the drain end of the siphon into the gasoline container. Siphon the gas into the container. All of the fuel must be removed from the gasoline tank on the mower to prevent spillage. Tip the lawn mower on its side. The underside of the mowing deck should now be exposed to you. Use the push handles to support the lawn mower. Place the 12-inch-long 2-by-4 between the edge of the blade and the side of the mowing deck. This will hold the blade in place as you loosen the large nut that holds the blade onto the engine shaft. Fit the correct-size end wrench or socket and ratchet set onto the nut. In most cases, depending upon the engine type and model, the nut will range from ¾ inch to 1 inch. Turn the wrench or ratchet counterclockwise direction to loosen the nut. The 2-by-4 may fall from its position. Place the board back into place. Once the nut is loose, remove with your hands. Keep in mind any large washers that may be used to space the blade from the mowing deck on the backside of the blade. Retain the nut and all extra washers. Replace the blade, washers and nut in the reverse order of removal. Coordinate the removal of the lawn mower blade with an oil change to the engine. This allows you to keep up with proper maintenance not only to the blade, but the engine as well. Consult your engine specifications for amounts and type of oil required for your model. Wear leather gloves to prevent sharp edges on the mowing deck or the blade from cutting your hands.